Johnny Knoxville is up to his old tricks, but this time away from the majority of his fellow jackasses. Don’t worry, though, it’s still very Jackass. 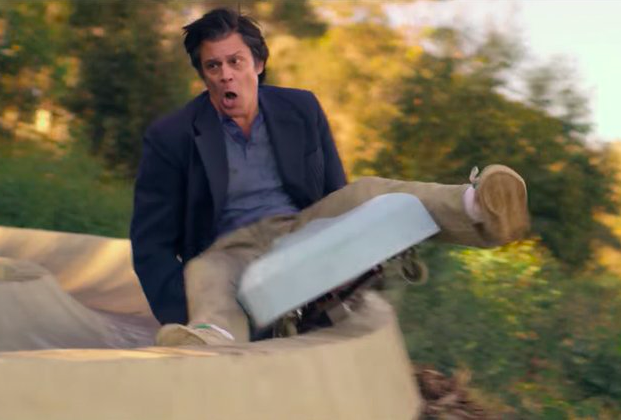 Action Point, which hits cinemas June 1, fusions real-life stunts with scripted dialogue and story, in something that will definitely be a hit among the 47-year-old’s biggest fans. Jackass alumnus Chris Pontius also joins Knoxville as he reminisces about a no-holds-barred theme park he used to run to his grandson. Directed by Tom Kirkby, the trailer is full of all the tropes we’ve grown to love over the years. I thought of the most painful stunts I could, and we made a film. And boy did it cost me: I got more injured on this than on any Jackass film I’ve ever done. Because all the stunts we did were real. I asked the stunt guys, “Look, we’re gonna do them for real. So no pads, and no cutting on the action.” I felt kind of bad for asking them to do that, but actually they were psyched because they never get a chance to do that. There was a good energy on set. I had four concussions, I broke my hand, I busted my meniscus, whiplash… Maybe the worst one is I got back from the emergency room one night from a gnarly concussion and I had a little blood in my nose, so I went to blow my nose, and when I blew it, my left eye popped out of its socket. He’s like “A-hahahaha.” I’m like, “I’m serious.” I had to go straight back into the emergency room. Knowing that Jackass 4 probably won’t happen, at least anytime soon, it’s nice to know some of the gang are carrying on the yucks.